What is the best best cell phone radiation protection? I came across this clip of a news report actually covering the subject. I found that surprising! Even though they mention that “The FCC notes, no scientific evidence currently establishes a definite link between wireless device use and cancer or other illnesses,” I am surprised they’re even talking about the subject. This video shows that cell phone radiation protection devices and more are able to block EMF exposure…but they can also increase it, acting as a mirror and bouncing signals back at you. What this video makes clear is that circumstances change up just how well these can work. They mention some fair tips near the end about lowering your exposure, even without these devices. And of course, I’d recommend Blushield, not to block EMF’s but to provide coherent fields for your body to sync up to. Remember, that Blushield works differently than any of these “blocking” technologies. For instance, this cow study shows that the cells create an immune response to EMF as if it were a invading organism like a virus or bacteria. Anchor: A growing number of products claim block potentially harmful radiation from our mobile devices. Whether or not you’re concerned about the health effects, those are pretty big claims. Only On 5 Tonight, Julie Watts put some of the most popular RF blocking products to the test. Julie Watts: From blankets to cases, there’s no shortage of products that claim to block up to 100% of electromagnetic radiation or RF from your devices. Sound too good be true? Most experts say it probably is. Michael Newark: The material could do a 100% in the right situation. Julie Watts: Electrical engineer and EMF specialist, Michael Newark, notes these product claims often refer to shielding technology, not the products themselves. In many cases, the FCC certified labs they cite, use a controlled signal generator and test raw materials. They don’t test the actual product using a real phone. Michael Newark: There’s all kinds of things that can happen in real life situations. Julie Watts: So, we wanted to find out just how much RF these popular products might actually block in the real world. Using three different RF meters. Julie Watts: And actual phones on two different networks. Julie Watts: We tested eight RF reducing products multiple times over the course of a day. Speaker: Okay, so we’ll take the average of those. Julie Watts: First up, RF blocking cell phone cases. Michael Newark: The cover has to be closed on the side towards you. Julie Watts: Three of the cases we tested are intended to be used with the shielded front cover closed over the face of the phone even while on a call. Michael Newark: I would know that because I know how these fields work, but I think other people might miss that point. Julie Watts: The fourth case, the Pong, claims to redirect cell phone radiation away from the user. Our real world test did fine. All the cases substantially reduced RF omissions from the face of the phone. Michael Newark: Almost a 90% reduction. Julie Watts: In fact, the flip cases reduced RF by up to 90% when used properly with the case closed. 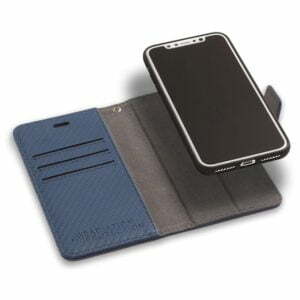 However, depending on the phone network and position of the cases, some actually increased RF, doubling the radiation when used like this with shielded front flap open folded behind the phone like many people use flip cases in the real world. Michael Newark: These frequencies usually get reflected like a mirror, so you’re seeing what used to go out the back of it getting reflected to you. Julie Watts: Both the FCC and FTC warn, shielding products may actually increase your exposure to RF by interfering with the signal, however, the manufacturers tell us they generally don’t test the cases in different positions. Now, Pong tells us, handheld RF meters like these are not suitable for quantifying the effect of its case. While SafeSleave says, testing outside of the lab with ambient and uncontrolled RF may result in unreliable readings. And that’s the concern. Experts say these products perform differently outside of a lab. For instance, the same case, in the same location, blocked more RF on a Verizon iPhone than it did on an AT&T cell phone, likely due to our proximity to the nearest cell tower. In a different location, or even facing a different direction, the results may have been different. We also tested a series of products intended to be worn on your body. Michael Newark: By the sound, you can already tell there’s quite a difference. Julie Watts: Our test found, from the Belly Armor Blanket Nursing Cover and Boxers to this RF blocking tank top purchased on Amazon, all of the garment shielding products we tested blocked about 80 to 95% of cell phone RF when used as directed, covering your body, your baby, or in this case, the test meter. Michael Newark: The problem with garments is you’re not covering your whole body. Julie Watts: Bottom line, Newark says, shielding is tricky. Michael Newark: In most cases, the shields when used the correct way, will reduce your exposure. But, under the right circumstances, they can actually make things worse. Julie Watts: The best way to reduce RF is to increase distance and decrease your use. Text instead of talk. Opt for speaker over wired headsets, but wired over Bluetooth, and keep your phone in airplane mode as often as you can. Julie Watts, KPX-5. Anchor: Now, the FCC notes, no scientific evidence currently establishes a definite link between wireless device use and cancer or other illnesses. Neither Defender Shield nor RF Safe responded to our request for comment. Like with many things what is the best cell phone radiation protection? The answer is it depends. While these cases can block frequencies, nothing is full-proof…except perhaps proofing your own cells from EMF’s with the scalar waves generated by Blushield technology. A good place to get started is with the most popular seller, the Home Pack which features a plugin and portable unit.